Don't listen to the people who say to cut back on training your strongest, freakiest muscles. 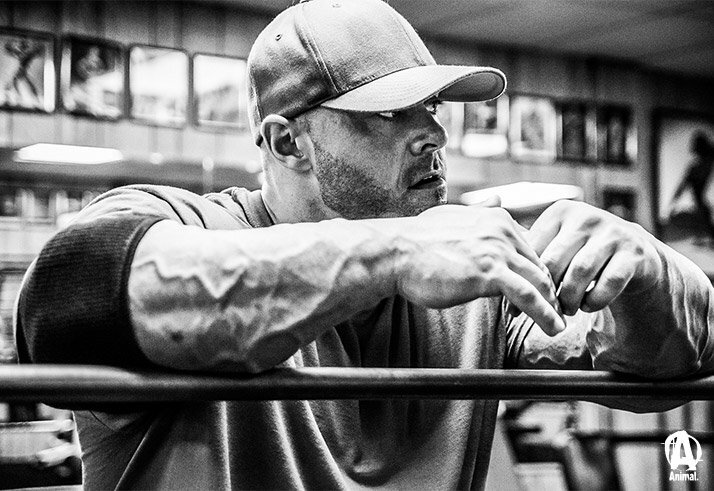 Frank "Wrath" McGrath saves his strengths for the end of a workout—and then savors them. So much ink has been spilled about "bringing up" muscular weak points that it's easy to overlook what to do with standout body parts. Bodybuilding purists often recommend backing off in intensity and training these parts less, claiming you should save your energy for weak points, promoting overall balance and symmetry, and creating a beautiful physique that flows seamlessly. But this is Animal. We've always wanted you to be proud of who you are and embrace the freakiness that makes you unique. Nobody embodies this call to individual freakhood quite like IFBB pro and Animal athlete Frank "Wrath" McGrath. He sports a complete physique that has left its mark on the competitive stage, but is most widely known for a pair of the wildest arms, from wrist to shoulder, in the history of the sport. Instead of shying away from training them with focus and intensity, Wrath has continued to train them twice a week for years, further accentuating and emphasizing some of bodybuilding's most recognizable appendages. So how has this man figured out how to have it all? 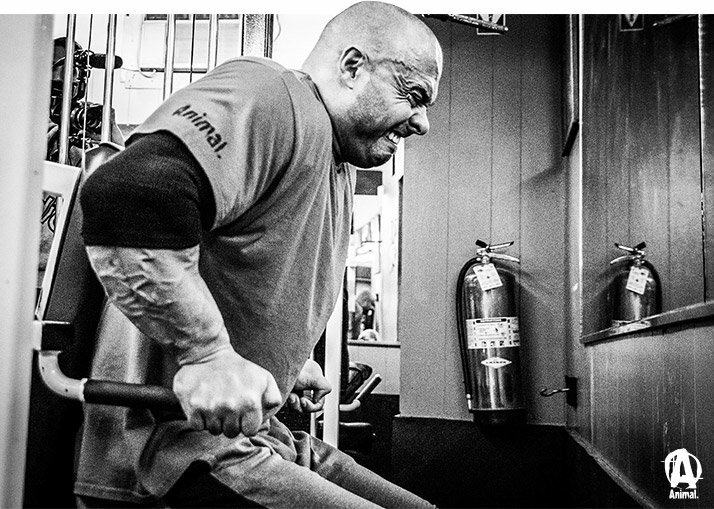 He took us to an iconic New Jersey gym and Animal's home away from home, Diamond Gym in Maplewood, to show us how he's working his arms right now. In his last Guns of Wrath workout, McGrath said he normally prefers to train arms twice a week: one heavy-weight biceps and triceps routine, and one high-volume biceps and forearm workout. But like any lifter worth his 2XL Animal tee, he also tends to change everything immediately after he says the word "normally." So today, he hit high-volume biceps and triceps, using more machines than usual to blast his arms from every angle. "I was just changing it up today," he explains. "A lot of people say they don't like machines, but I love them. I always try to incorporate both free weights and machines to get the benefit of both. Why not, right? It's there. 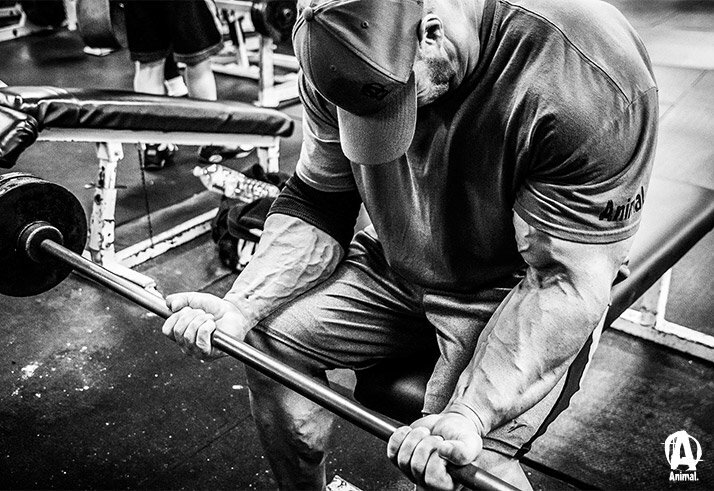 There's lots of great angles from machines that we can't do with free weights." "Every time I train, I don't really know what I'm going to do in my head. I just decide as I'm going." He started with triceps, since he considers them the weaker of his two upper-arm muscle groups and wanted to hit them with his full energy. But don't take that to mean that his biceps and forearms suffered at all from his saving—and savoring—them for later. Choosing a high-volume rather than high-intensity routine allowed him to keep plenty in the tank for his showpieces. Get 6 Animal Whey Trials for $29.99! Go Now! "I just saw the bench and thought, 'I'll try some overhead ones to get a good stretch in the tris today,'" he says. "Every time I train, I don't really know what I'm going to do in my head. I just decide as I'm going." Wrath chased this bread-and-butter movement with two machines meant to maximize the pump: the dip machine and cable straight-bar push-downs. In both cases, he didn't count reps strictly, but rather proceeded by feel, squeezing and stretching, enjoying the push and pull of his body and mind. Machines are special, he says, in that they allow him to prolong this brutal game just a few reps further than free weights. "I'm just trying to totally fatigue the muscle 100 percent," he says. "When I feel like I can't get one more full rep, I'm still trying to get a little more stimulation in there. It's like my brain isn't done doing the set yet, even though the muscle is already fried. I want to keep going 'til I can't do no more." Why delve so deep into pain? Don't ask, he says. Just trust him and do another—and another—rep. "It's that part of me that likes that pain and that burning like crazy," he says. "That's what some people need: that little bit of crazy that likes that pain, to get to the high level where they want to be." If you've watched any of Wrath's previous videos, such as "Intuitive Back Training," you know he allows himself to be curious in the gym. Sometimes, he'll use a unique bar or handle just because it catches his eye and he's never used it before. Today, rather than settle into the familiar pad of the same old preacher bench, he took a "same, but different" approach and performed cable preacher curls on a preacher curl machine. 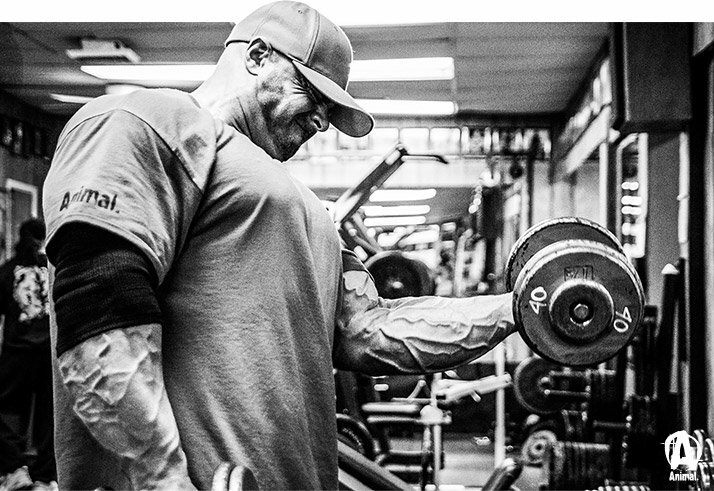 You can experiment all you want on arm day, but don't overlook the classics. "Over the years, I've found that the preacher curl is one of the best for me, because it really puts the most blood in there, and the best contraction," he explains. "But these were two different machines that I never use, and I wanted to try them—and they were awesome." With that dalliance out of the way and the pump reaching its peak, it was time for one of Wrath's favorite meat-and-potatoes biceps exercises—the alternating dumbbell curl. "I did them last today, so I did them a little lighter. No crazy weight," he recalls. "At the end, I did a dropset. Really just burned them out for the last set of an old-school basic bodybuilding exercise." "I remember I would get up at like 7 in the morning and start training, and the only reason was that I wanted that feeling of a pump when I got to school. I wanted to walk around all swole," he recalls. "So every single day before school, or every second day, I would go down and do forearm curls and reverse curls. Everyone would be like 'Oh man.... Your forearms!' And I thought, 'I want this all the time.'" "I think balance is important, but it's good to be known for something freaky that nobody else has." "I think balance is important, but at the same time it's good to be known for something freaky that nobody else has," he says.